What are some great pool cleaning tips you should know? Owning a pool can be a lot of fun but it can be a source of frustration, especially in the maintenance and cleaning aspect. When it’s time to drain the pool, do some scrubbing and replace with fresh water, you will need to consider these tips to make the job easier. Leaves floating around in your pool are never a pretty sight, but did you know that too many of them can affect your pool’s chlorine levels negatively? Pull out your trusty skimming net during regular intervals to get rid of the leaves. Don’t forget to constantly check on the skimmer basket, so you don’t have to deal with unclogging it. Maintaining a swimming pool is tedious and time-consuming, which can cause pool owners to put off cleaning until the last possible minute. If you want a pool that lasts for a long time, you will need to put in the effort to clean it regularly. Doing this presents major benefits, including keeping the build-up of scale in the line where water meets the air and making the pool ready to go at any time. Pay special attention to the pool edge or border and take the time to scrub or clear out the water line forming. When done right, there won’t be any scale on the walls or pool surface, making your investment look absolutely pristine. No matter how deep your pool is, one of the best ways to eliminate the dust and dirt lying on the tiles and surface is via a vacuum cleaner. 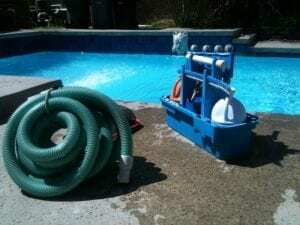 Not any vacuum will do, though- some are better than others when it comes to pool cleaning. You can opt for a manual vacuum if budget is your top priority. In the world of pool vacuums, premium is better. They do a great job in sucking out dirty particles than a cheaper product, for example. Moreover, it does so faster and can save you energy in the long run. For hands-free cleaning, consider an automatic pool cleaner. All you need to do is to set it up, turn it on and let the pool equipment do its work. It’s more expensive than a manual vacuum but it’s more convenient. Give your pool cover special attention as it accumulates a lot of dirt day in and day out. Clean the cover using a sponge or other various cleaners. Afterwards, it’s best to allow a day for the cover to breathe and not use the pool during this time. The pool filter is an important part of your swimming pool. It’s easy to clean- simply have it complete a backwash every week to get rid of the dirt and debris. Pressure eases off and you’ll be free to use your pool in a safe manner. Aside from the pool cleaning tips mentioned above, your pool should be regularly inspected and serviced to ensure it’s operating properly. Routinely cleaning your pool will prevent buildup from occurring. Whether your pool is in need of repairs, or in need of routine servicing, our team here at Regal Pools and Design is prepared to help with all of your pool care needs.